People talk! “The first marathon is the hardest!”, “Stay focus, especially after the 30st km”, sometimes even things like “Be happy if you finish it in less than 5h”, “Training is the hardest part”. But the last quote is the most true. It’s veracious. Not really because of the intensity since once the first session is done, we’re happy with the progress. The difficult days happen but we need to settle for it and to remember we can be proud to make the first steps and to go out while everybody is cozy at home. We’re good because we did these extra 30 minutes running in our day. The last month and the last two weeks even more, time flies and stress stacks up. It’s time for being confident and for trusting ourselves. Don’t give up and doubt while comparing our training plan to other’s. We have nothing to lose, only kilometers to add and honours to win for making this journey. Let’s go, nothing is different than the other days, let’s enjoy and try our best…. with a smile! The route is AWE-SOME! A beautiful loop with no distance done twice (which is uncommon) – Check this out : map. 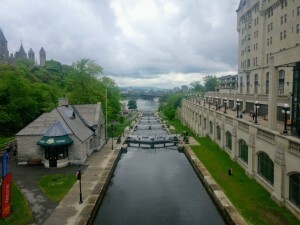 Most of the route is close to the water (Rideau Canal, Dow’s Lake, Ottawa River, and a bit of the Rideau river) plus – speaking about water – we have water to drink every 3 km!). The first kilometers are done so quickly we don’t feel them. After the two first, we’re still fresh, just warming up. It’s time to think: only 40 remaining! It can feel a bit depressing but it’s not. We feel fresh, the route is just ahead of us and it’s beautiful and even more because we run it. Km are just a countdown! Then after, our own personal record is beaten. It’s the distance we made in training 3 to 4 weeks ago. For me, it was (just) 26 km. It’s so exciting to beat our record! But we still need to stay focus on the present moment and our current feeling to keep a good mix of positive thinking. A few kilometers later, the knee starts to creak. Mine doesn’t like to always keep doing the same movement. Let’s make some change to unrust it and keep it running well! It works and it’s good for self-trusting. Still feeling good, I tell myself it’s not the 30st km but instead I only have 12 more km to do. Nothing I’ve ever done before! We’re in Gatineau, and it’s pretty cute with the river and now a large park full of trees (Rockcliffe Park)! KM 36, I am fine. 6 km remaining! We have never been so close to run as much! 🙂 At the water point around the km 38, a runner seems to relax by crouching and give me this idea to crouch myself during my self imposed drinking pause. Mistake. My legs feel like concrete. I cannot even go down too much. But, it is too late, from now on, I feel like having concrete legs. It’s by walking-running at a very slow pace that I will finish the race. 4 km remaining! I lose my rabbit pacer but never mind, it wasn’t my goal at the beginning and I remind myself that my primary objective is: finish my first marathon (less than 5 hours would be better and I still can do it!). I can confess that following a 4:15 pacer during almost the half of the route and doing so good until the km 38 got me hooked on the idea of 4:15. Arriving on the canal bank, the 2 last kilometers looking like a back and forth on one side of the bank and the other is not making it easy. Let’s stay focus. More than ever. We could cross the canal taking the bridge or even swimming, please! But stay focus and run. You feel your legs, you are alive. Get back in your head, in your mind, in your body. It is not so bad if I still can jog! Let’s play the power song! Let’s be carried by the encouragements and fun messages. Even though the finish line and the medal are less important for me than the route which was worth the run and sight, I receive the medal from a volunteer who congratulates me calling me by my first name! 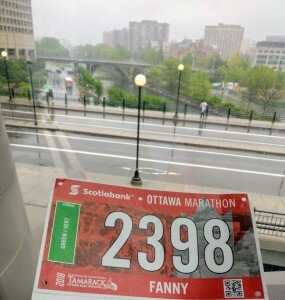 As if she was honored, as much as I was to run 42.2 km. Yes, ok, it was the cheery on the Sunday! 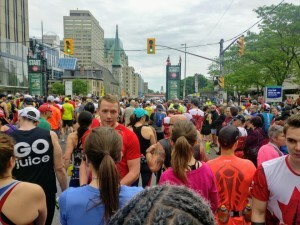 This entry was posted in Uncategorised and tagged achievement, hapiness, marathon, ottawa, prep, race, running, running tours, sightrunning, training. Bookmark the permalink. 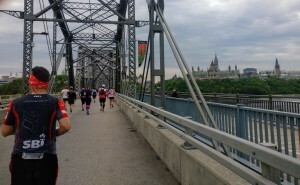 ← Spring in Montreal… and runners.